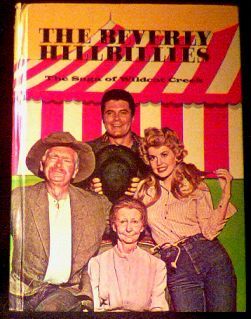 Whitman tv adventure novel featuring Jed, Elly May, Jethro and Granny on the cover. A name in pencil has been erased neatly from inside front cover. Four pages inside middle of book have small imperfections in lower corner of page, otherwise the rest of the book is in beautiful shape. Nice family photo of the Clampetts. Website design and hosting by Sohodojo Business Services. Item 427 of 466 items displayed in viewer. 0 items in cart.